About 5,000 people attended Saturday's ceremony for the USS Manchester at the New Hampshire State Pier in Portsmouth. 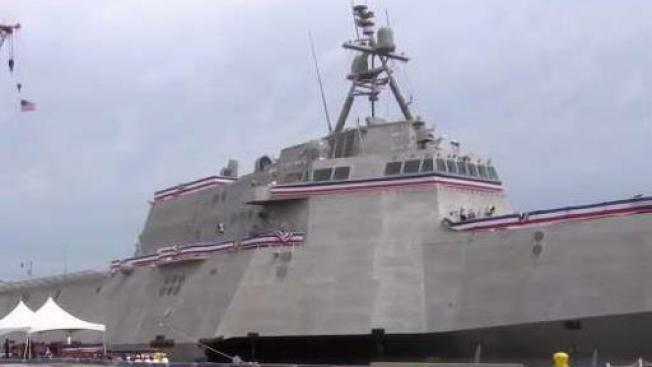 The Navy's newest littoral combat ship has joined the fleet in a ceremony in New Hampshire. The warship honors New Hampshire's biggest city and its sponsor is Sen. Jeanne Shaheen. The class of ships can hit speeds of up to 50 mph and utilize steerable waterjets instead of propellers and rudders to operate in shallow water. The Navy has two different designs. The Manchester is the seventh of the tri-hulled, aluminum ships built at a shipyard in Alabama. The ships are designed to be equipped with swappable mission modules for surface warfare, anti-submarine duty or mine removal.